You wish to create a perfume for your brand? Create the signature fragrance of your brand, your store? Create a perfume for a very special occasion? 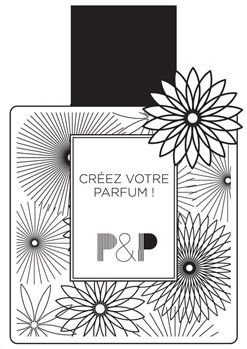 Parfum&Projet creates your customized perfume from A to Z. Just like an architect, Parfum&Projet selects the finest craftsmen and coordinates their skills to create high-quality, finished fragrance products that meet the standards and identity of each customer. Located in Grasse, the heart of the French perfumery industry, Projet & Parfum has access to the main suppliers and vendors of the industry. Parfum&Projet creates your own and complete perfumed line eau de parfum, diffusers and room spray, bath and body care, candles, perfumed cards. Original fragrances created in respect of the French savoir-faire of perfumery in Grasse and developed by talented perfumers to answer the desire of a modern connoisseur. Parfum&Projet offers a fragrance library in constant evolution responding to fashion trends but also proposes to develop your own and exclusive fragrance with her perfumers. that includes matching caps and atomizers with a variety of shapes, colors and finishes. The finest and unique decorative packaging for a luxury product. With your logo, Parfum&Projet designs your product with her perfume designers: box, sticker, silk printing according to your graphics standards, colors, or logo. You will receive a ready to sell prefume, in accordance with the legislation (IFRA, cosmetic file at your name) and entirely Made in France. Their perfume project came true. Claudine Roublot, founder of Parfum & Projet, believes the creation of unique perfumes should be a process within the reach of all who desire it. Her experience in the fragrance industry has spanned more than 15 years, working with some of the finest and most respected brands in the world. Parfumerie Fragonard, Diptyque, Catherine Memmi, Ladurée, Imperial Hotel New Delhi, Raffles Hotels, All Nippon Airways, Le Printemps, Anthropologie, Marks&Spencer, are but a few of the clients that benefitted from her olfactory marketing experience and allow her today to lend her knowledge and skills of the complete process from creation to distribution to companies seeking to create their own signature fragrances. Today she offers her experience to fashion and accessories brands and stores, concept stores, hotels and spas, private and public companies, event organizers to bring them a full service.